I love, love, LOVE this roll! This is probably my favorite type of sushi ever. I came up with this when I was making tempura shrimp for a different roll. I had some extra avocado from making California Rolls, and we had some leftover green onions from something I had made a few days before for Son. 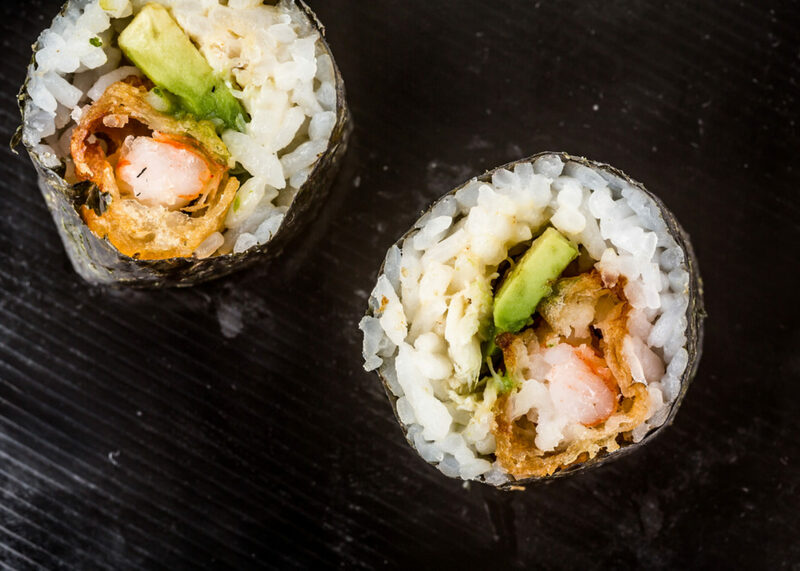 If you like tempura shrimp, you will definitely love this roll. Roll the sushi, using one green onion stalk, several avocado sticks, and 2 1/2 slices of tempura shrimp as your fillings. Do you have a recipe for the tempura shrimp? Sure! I’ll try making some, and see how it works, and I’ll get you the recipe! This sounds great. How would you go about making a crunchy tuna roll? Looks great. The crunchy rolls around here usually have panko (I think that’s what it is) in them for the crunchy effect. I have never seen panko in the store before, (although I have never really looked either 😉 ) but I’ll definitely look for them next time I make a crunchy roll! 😀 Thanks! I love this roll too. It’s on the menu! Although I don’t put avocado in mine, I use sliced cucumber. Try to hold on to your seat. I batter and deep fry the entire roll! Which probably triples the cholesterol and marches me toward an age-50 heart failure. Who cares, deep fried stuff is tasty. I just made this last night; it was my second attempt at making sushi (I am still a sushi newbie anyhow). It might not have been very pretty, but…YUM! Will definitely make it again. Should one soak the nori in water or something before using to make it flexible? All the nori I’ve used is generally dried and crisp and breaks into tiny pieces when rolled…..
Also, this recipe does not specify where and when to use the nori. I am guessing this is maki and the nori goes on the outside of the rice ie the bottom of the “stack” (before rolled)…. Is the nori sealed with water to make it stay closed? You don’t need to soak the nori – all the nori I have ever used rolls just fine, without breaking 🙂 To find out how to roll the sushi, follow the link in the 9th direction. That page will give you all the instructions on how to roll the sushi. Hope that answers your questions! I think you need to come home and make some for me. My favorite sushi EVER. No, but like bacon and avocado and…is there a limit to the number of ingredients you can use? Because bacon and avocado and shrimp tempura and green onion…or change the shrimp for a string of mozzarella, or can you use tomato? Yum. Hmmmm that’s a thought. That actually sounds really good… I might have to try making that sometime soon! I would love to see how this roll would come out if after you batter it you added panko bread crumbs for an added crunch. Or add panko to the batter. made this and the spicy tempura roll the other night. i love, love, LOVE them too–thank you! Just finally tried this recipe after waiting weeks to find the time to do it. I was glad to try something beyond the California roll. For me, this was a much more involved recipe. I made the tempura shrimp myself as I couldn’t find premade. It was nice to try it but I probably wouldn’t do it again if I could make the premade. My kitchen was quite a mess after I was done. Next time I might consider adding cream cheese to the recipe or in place of the avocado. I thought this recipe straight up lacked some of the smoothness I found in the California rolls I made previously. Nonetheless, it is delicious overall! Thanks for sharing this idea. Now I just have to figure out what to make next . . .
steph – I’m so glad you like it! Idetrorce – Pardon, what don’t you agree with? Ty – Wow yeah I can imagine that it’s much more difficult if you make it yourself! You can usually find frozen tempura shrimp in a normal grocery store, or I get it at Costco when I’m making a lot. Hopefully you can find some next time! To get the desired smoothness, you could try cream cheese as you said, or if you want the same sort of thing as the California Roll, you could try adding a little mayonnaise. I’m glad you liked it! yum yum! i love your recipes! every sunday is sushi night, now! this roll is also one of my fevorite!! !….though i put cucumber instead of avocado!…i also put some japanese mayonnaise…i think putting “japanese mayo” makes it way better. In addition, sauce is unnecessary since mayo is already with the topping inside. awwwww sushii yummyyy i want some! Chris – You’re very welcome! I ate sushi for the first time it was california roll and crunchy roll. Well the cruncy roll won me over it’s so good recommend it to first time sushi eaters.I will try this receipts love to see what I could make. Thanks for the receipt!! Yeah, this is a great roll for people who are new to sushi – everyone who tries it loves it! Great receipt thanks for sharing. I’ve personally eaten this type of shrimp.